BENEFITS: Liv-Cleanse Formula provides liver health support that you can count on. It contains 100 mg per tablet of Milk Thistle seed extract standardized to 80% silymarin, which has been clinically shown to protect the liver and promote proper liver function. In today’s polluted and fast paced society, the liver takes on ever greater significance for maintaining our overall health. The liver is our primary organ for detoxification of substances taken in from outside the body and also harmful substances created within the body. In addition, the liver is involved in the body’s energy production, nutrient assimilation, fat digestion, hormone balance and much more. Extra liver support is especially needed by people who: drink alcoholic beverages, are under a lot of stress, take prescription drugs or other drugs, smoke cigarettes, or are exposed to chemicals in the workplace or in the home. 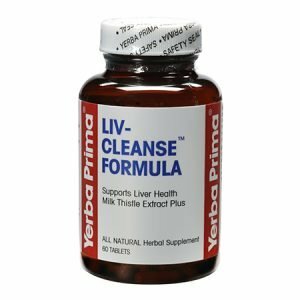 Liv-Cleanse Formula promotes liver health by stabilizing liver cell membranes, by protecting liver cells from damage due to alcohol, chemicals and other toxins through its strong antioxidant effects in the liver, and even by helping to rebuild normal healthy liver tissue. Liv-Cleanse Formula contains a premium milk thistle seed extract standardized to 80% silymarin, plus the liver support herbs Dandelion root & leaf extract and Yellow Dock root extract. Though known primarily for its bright yellow flowers and for being an unwanted intruder in our lawns, the simple dandelion is one of the most treasured and beneficial herbs for health maintenance. It is gentle, safe and reliable in its action. Dandelion root and leaf have a long history of use for both cleansing and maintaining the health of the liver and kidneys. Yellow dock root is also a beneficial liver support herb, which works in concert with milk thistle and dandelion for liver health. SUGGESTED ADULT USE: Normal Use: 1 tablet 2 or 3 times a day as long as desired. Intensive Use: 2 tablets 3 times a day for 2 to 8 weeks. Best taken between meals, with liquid. If there is any digestive upset, take with food. Liv-Cleanse Formula can be used either short term for a quick liver cleanse or long term on a daily basis to help maintain liver health. For additional cleansing benefits, Liv-Cleanse Formula may be used with a Yerba Prima fiber formula. QUALITY ASSURANCE: Yerba Prima’s products are made only from premium quality ingredients. CAUTION: Do not take tablets if you have difficulty in swallowing. If you are pregnant, nursing, taking medication or are under a doctor’s care, consult a health professional before use. INGREDIENTS: Milk thistle seed extract 80% silymarin, dandelion root & leaf extract 4:1, yellow dock root extract 4:1. Natural source excipients: calcium carbonate, vegetable stearine, cellulose gum, maltodextrin, vegetable magnesium stearate, silicon dioxide, clear cellulose coating.